We have several custom software solutions. CargoMax USB is a dedicated package written for both PC and USB keys. The software makes draught survey and trimming calculations for bulk carriers easy. It also includes hatchwise calculations and easy “one click” reports. 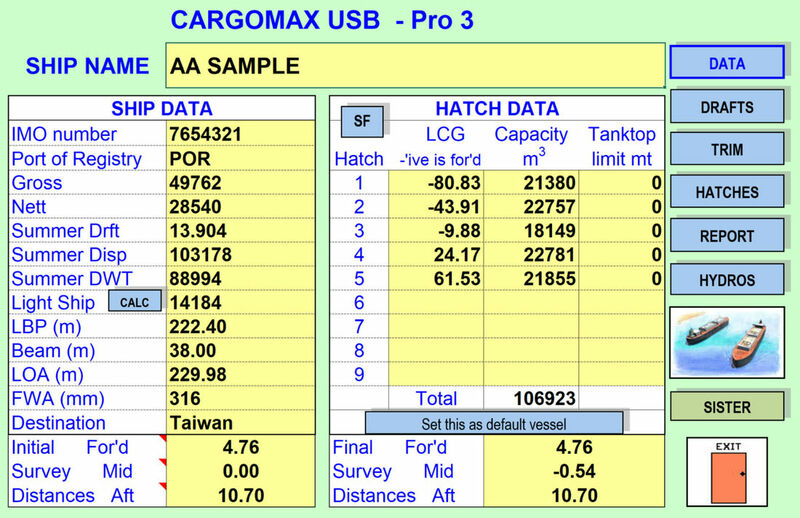 The CargoMax USB also comes with voyage planning distance tables and ETA's. ​​CargoMax has recently won the Australasian Institute of Marine Surveyors award for Excellence in Technology at the recent biennial conference in Sydney. HMS Portal provides users with live vessel performance data for ship vetting and load monitoring. It also provides our teams with an online Take 5 app which ensures hazards are reported and shared in a live environment. Available now - CargoMax for android - purchase here. A full featured application which uses the full database of ships totaling over 7000. The database will continue to increase over time with user data. Easy trimming calculations in the palm of your hand giving fast and accurate results. Searching the database for a sister hull has never been easier with a refined new search function in the android version. ​Fast load rate ports now demand shorter delays for trimming. CargoMax allows you to reduce delays during the trimming or interim survey. Instant reports can be printed direct to your wifi printer or to pdf and email. Introducing CargoMax USB Pro 3, the latest version of the industry leading survey software solution. Now with over 7000 ship files and new features making it faster and easier to use. USBs are now available in new colours and come with a free update function that allows you to continually update your vessel database from the CargoMax cloud at the touch of a button. Still at the same low price, it is a must have tool for all Master and officers sailing on bulk carriers. Be one of the first to purchase this amazing product. Exclusively available online at www.cargomax.com.au. Which colour will you choose?